There's the normal, home-sized large one & then the mini fun one! "MARIGOLD HL milk, the perfect balance of highs & lows!" And what they meant by the "perfect balance" is that MARIGOLD HL milk has HIGH amounts of the good stuff & LOW amounts of the not-so-good stuff to strike a perfect balance! There will be FIVE winners & one of them could be you! 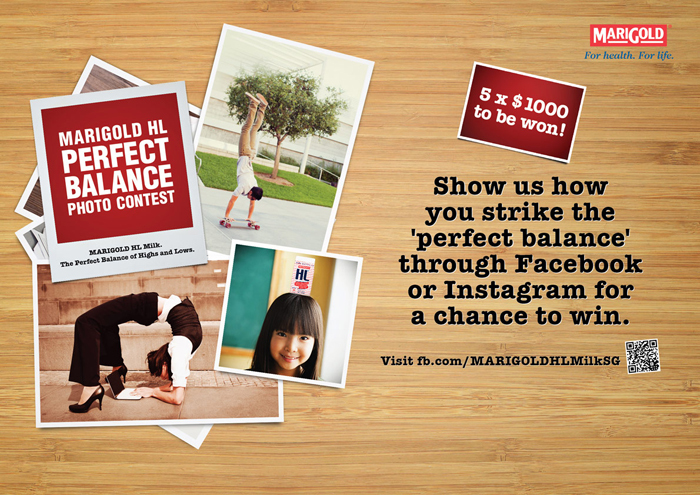 Join the MARIGOLD HL Perfect Balance Contest! Judging of the contest will be based on creativity, determined by the judges' votes (60%), & public voting (40%)! So remember to get your friends to vote for you! There will be 5 photo winners receiving $1000 cash each & 5 lucky voters receiving $100 cash each! The contest ends 08 November 2012 so hurry, get creative! I had a go at the photo contest too! Hope I get to see some brave ones using the big ones! And in bigger numbers! Tried on my right side instead! For like... 5 seconds hahaha. The milk carton dropped after that! And yes, the cartons are MEGA STURDY lol. I dropped them quite a few times but it stayed intact! So I got more ambitious! Wahahaha not bad already right? I can balance a Macbook Pro on my head! Like yes, surprisingly steady too. I can walk around & turn & all haha. 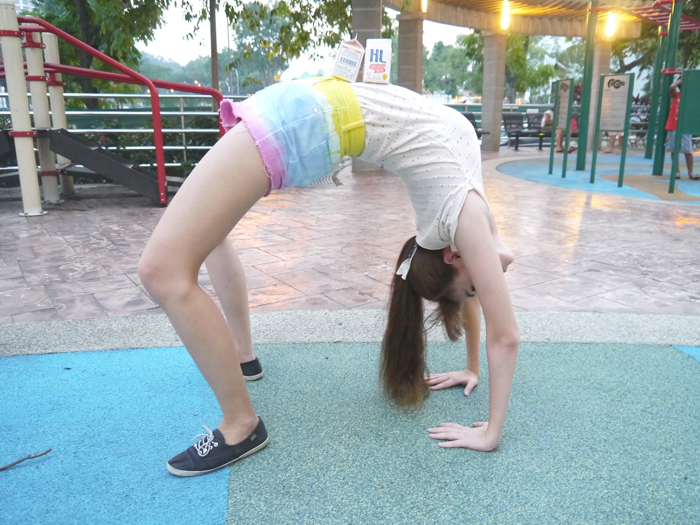 Then I decided to head outside to try more acrobatics! Would be cool if I could line up a whole row of MARIGOLD HL milk cartons! This pose can fit quite a lot of cartons too I think haha. Doing all that balancing tired me out! 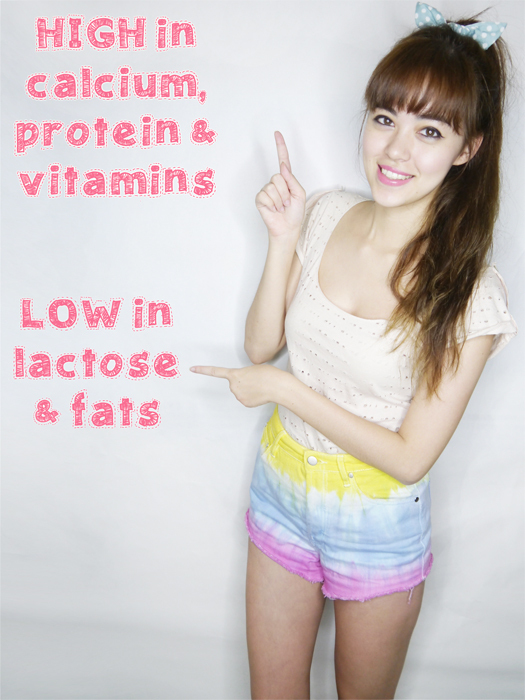 So I re-energized with a small carton of MARIGOLD HL milk! Try your hand at their Perfect Balance photo contest! You don't even need to be in the photo! Maybe your dog has a flat head like me? Hahahaha. Or maybe you can make a big MARIGOLD HL milk carton tower, Jenga-style? Remember, there will be 5 winners of $1000 each! Contest ends 08 November 2012! 9 comments on "MARIGOLD HL Perfect Balance Contest"
wow love the superman one hehe! Do you have plastic surgery? THis is crazy! !How you can do that!!! WOW!!! Anonymous: Top from Mango & shorts from Nastygal.com! lol... ok, i'm very impressed :D great job!